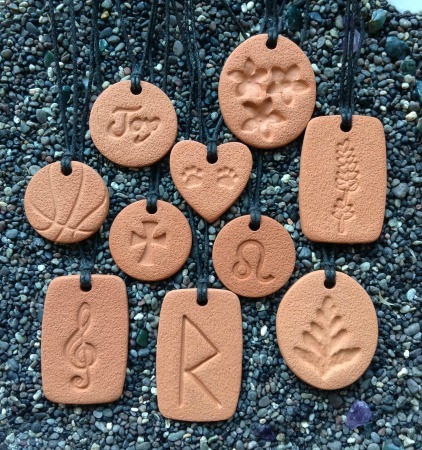 We make Terra Cotta Pendants in nearly 100 different designs to give you many options. We love symbolism, don’t you? The Runes, the alphabet which was common before the Roman alphabet replaced it, are rich with meaning. Just a few simple strokes have such a wealth of meaning. When you wear the symbols, you are vibrating the meaning and your intention as well. I like to set an Intention before wearing a new design and christening it with its first oil. The combination of intention, symbol and aroma is a powerful one! The other cool thing about the symbols, such as the Chinese Word symbols, is that no one needs to know that you are wearing “Luck” or “Journey” – they are private and personal for only you to share. Besides, you can tuck the pendant in if you want. We make many different designs because we want you to have a lot of choices! We accept design suggestions to be put into our Idea Box. We usually introduce one or two new designs per year. Let us know what you’re thinking about! We’d love to hear from you! ©2013 Terra Cotta Pendants About the Author: Lori Gosselin has worked in network marketing since 1997. In 2003, this passion led to the creation of www.Terra-Cotta-Pendants.com This is one in a series of general info articles about Terra Cotta Pendants. See essential oil marketing articles here!